A major thrust area for research of SCC is in the understanding formwork pressure. Provisions of the current ACI Manual of Concrete Practice (i.e. ACI 347R) do not specifically address SCC, but recommend that unless a method based on appropriate experimental data is available, formwork should be designed to withstand the full hydrostatic head of fluid concrete. This guidance generally limits contractors to short walls or extremely strong formwork. Thus, there is great need for better understanding of the pressures that are actually seen in cast-in-place applications in the field. Further study is necessary so that equations can be developed to reliably predict formwork pressures for a range of casting rates, and to calculate allowable casting rates based on formwork strength. As in the case of conventional concrete, there are many factors governing the pressure exerted by SCC, including: the stiffening behavior of undisturbed SCC, the casting rate, the height of the formwork, temperature, vibration, and susceptibility to disturbance of the concrete. An additional difficulty is that there are no standard methods for studying formwork pressure in the field or in the laboratory. Many laboratory experiments and field tests have shown that SCC pours do not generate full hydrostatic pressure at the bottom of the structure. 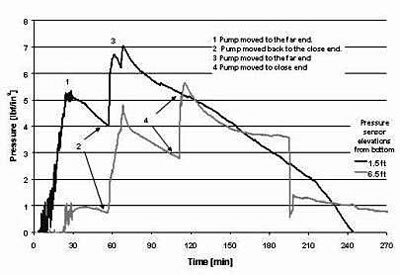 Tests performed by Vanhove and Djelal (2002) showed a maximum pressure 64% of maximum hydrostatic pressure for a wall placed at 25 m/h from above and a maximum of 68% of maximum hydrostatic pressure for a wall placed at 19.5m/h by pumping from the bottom of the wall. In their study, the maximum pressure was not found at the bottom of the wall but at a height of 1.5m. Maximum hydrostatic pressure was determined using the overall height of the structure. Testing has also been conducted in field installations. A 28-foot high wall was constructed in the structures lab at the University of Illinois at Urbana-Champaign. The wall was created with SCC material and filled in one continuous pour lasting about seven hours. It was found that only within the top four feet of placed concrete were pressures approaching full hydrostatic pressures recorded. The maximum pressure reached was 5.5 psi, which was only approximately 20% of the maximum hydrostatic pressure at the point of measurement. This wall was filled at a relatively slow rate, maximum of 5.5 ft/hr, due to the large dimensions of the structure (5 ft thick, 80 ft long and 28 ft high). The wall required 415 cubic yards of material. A companion test column was fabricated which involved filling a 10.5-ft tall column. The column was filled at a rate of 60 ft/hr and the highest pressure measured one foot from the bottom. The highest pressure recorded was 80% of hydrostatic pressure. The wall and column were filled using a concrete pump and the material had a target slump flow of 28 in. but varied during the day from 23.5 to 29 in. during the time of the pour and the density of the material was 151 lb/ft3. A large reconstruction project in Peoria, Illinois involved the construction of many new retaining walls. The project is being constructed with SCC for the walls. Several of these walls were instrumented with pressure gages to study the development of pressure on the formwork. Figure 1 shows the results of one such wall. One sensor was placed 1.5 ft off the bottom of the wall and the second sensor was placed 6.5 ft off the bottom of the wall. The first hour of pouring was at a rate of 9 ft/hr, the second hour at 4.5 ft/hr and slower for the final hours. The bottom sensor reached a maximum pressure of 7 psi with where as hydrostatic pressure would have been 20 psi. Additionally, the highest pressure was reached long before the pour was finished. It is also important to note that at some point in the pour additional concrete in the wall did not cause the pressure to rise, as evident by the maximum pressure occurring just over an hour into the pour which lasted 4 hours. There are several means of studying formwork pressure with SCC in the laboratory. One method used by researchers at the University of Sherbrooke and the University of Illinois at Urbana-Champaign (UIUC) uses a PVC tube with sensors mounted to the tube. Researchers at both universities use diaphragm sensors that measure total pressure and are in physical contact with the concrete material during the test. These experimental devices are used to study pressure drop over time. The sensors are placed at varying heights and each university uses different height columns. Figure 2 and Figure 3 show results of various mixtures from tests performed at Sherbrooke and UIUC, respectively. An alternative laboratory set up is used by researchers at Northwestern University. Their testing apparatus utilizes a short column of concrete, 300 mm, in a steel mold. Figure 4 is a picture of their test set-up. A loading frame is used to apply a load on the top of the column of concrete to simulate the effect of a much larger column of concrete. This can also apply increasing loads over time to simulate varying casting rates. The cylinder has two pressure cells mounted on the sides. One is used to measure total horizontal pressure and the second sensor is used to measure pore water pressure. The general procedure is to fill the cylinder and then apply an ever increasing load until a pre-determined maximum load representing a particular column height. That load is maintained for several hours to simulate the end of filling and the material at rest. It has been found through many laboratory trials that the particular material chosen for the formwork is of great importance in studying formwork pressure. Initial tests at UIUC were performed using cardboard tubes as might be used in the field to pour columns. These proved to be problematic in studying formwork pressure. The cardboard material absorbs moisture from the concrete and swells. This small displacement of the sensor causes the sensor to lose contact with the concrete, and this results in errant measurements of lateral pressure on the form material. A comparison of a plain cardboard tube, one with a plastic liner, and 2 PVC pipe configurations are shown in Figure 5. Many factors can affect the formwork pressure generated in the process of pouring SCC. This idea is no different than that for normal concrete. Simply, the faster the material is poured, the greater the maximum formwork pressure will be. As a general rule, formwork pressure is related to thixotropic characteristics of an SCC. 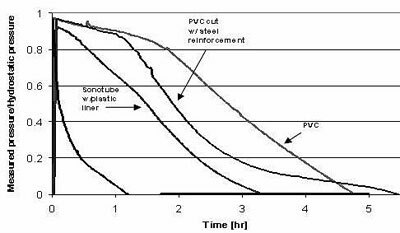 SCC that is strongly thixotropic—that is, it quickly gels when the material comes to rest—will display a more rapid decay of pressure, and lower overall pressures will be observed during construction. Other factors affecting formwork pressure include mixture temperature and the presence of set modifying admixtures. As would be expected, mixtures with retarding admixtures will experience a slower pressure drop and a higher maximum pressure whereas mixtures with accelerating admixtures will exhibit faster pressure drop and a lower maximum pressure. 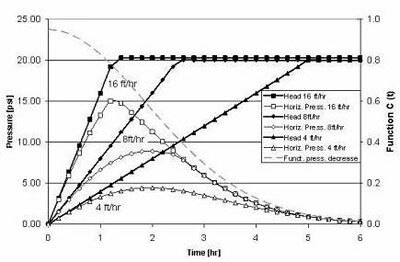 Figure 6 shows data collected regarding the influence of mixture temperature on formwork pressure decay. As might be expected, warmer mixtures exhibited faster pressure decay. Accelerating admixtures also lead to more rapid formwork pressure decay. A great deal of research has gone into the influence of thixotropic properties of SCC mixtures on formwork pressure. In general it has been found that mixtures developing cohesion at faster rates will exhibit lower maximum lateral pressures for similar casting rates and as a result can be poured at faster rates for a given strength of formwork. Aggregate bridging is one mechanism that has been identified to explain the “self-support” of SCC that occurs soon after SCC material is at rest (and well before the point traditionally defined as “set”). It is thought that as the material fills its form the aggregate will line up and touch each other to form a skeleton in the fresh concrete. As the gelation and hydration processes occur, this bridging will get stronger and will lead to a drop in formwork pressure. 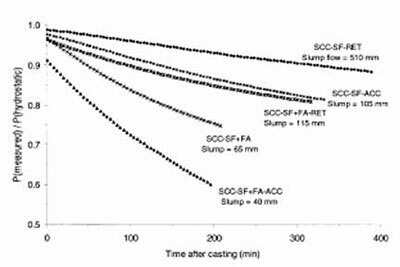 This mechanism continues to be studied, but there have been results to show the affect of varying coarse aggregate fractions in SCC mixtures. It has been shown that for mixtures of similar proportions of binder but varying coarse aggregate to fine aggregate ratios that the mixtures with greater coarse aggregate contents will exhibit reduced initial pressure and a faster pressure drop. As stated earlier, thixotropy of mixtures has a significant influence on formwork pressure. Binder proportioning is one factor that affects thixotropy of mixtures. Mixtures containing supplementary cementitious materials (SCM) exhibit greater thixotropy than mixtures with cement as the only binder material and ternary blends tend to show the greatest thixotropy due to increased solid concentration in the mixture. This increased solid concentration is due to the fact that cement replacements are done on a mass basis and SCM tend to have lower densities, resulting in a greater volume of binder material and increased packing density. Accelerators increase thixotropy while retarders reduce thixotropy. VMA has also been shown to increase thixotropy. Current ACI provisions for formwork pressure (e.g. ACI 347R, Eq. 2-2) were developed many years ago. These empirical expressions related pressure to the rate of placement and the temperature of the material. In recent years there has been an effort to update the equations to account for different kinds of cement and the density of the concrete through the Cc coefficient and the Cw coefficient. These still do not address many of the issues related to SCC where the increased thixotropic nature causes SCC to produce far different pressures than would otherwise be expected using the current equations. New models are in development to predict maximum pressure values with SCC mixtures. One such model has been proposed using the Janssen model and is a step forward in that it incorporates a measurement of the time-dependent behavior of the material where earlier work ignored time dependent affects. The unique feature of this model is that it measure friction affects and factors the friction between the concrete and formwork walls into the calculation of formwork pressure. 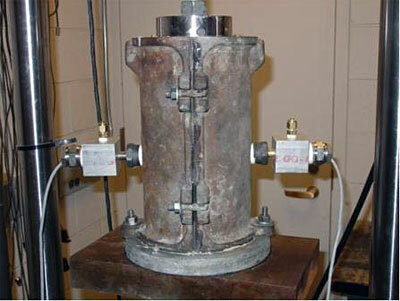 The test set up for this experiment uses a vertical load on the top, similar to the system used by the Northwestern University researchers, as well as a metal or wood blade which is pulled through the material. The horizontal pressure is monitored along with the applied vertical load as well as the force necessary to move the blade through the sample of material. Two time-dependent parameters are determined, one for the friction coefficient and one for the horizontal pressure. An alternative model for formwork pressure has been proposed by Khayat that relates pressure to rheological parameters. This model was developed by measuring lateral pressure on a cylindrical column and a rheological parameter called “break down area.” Pressure and breakdown area were compared for three different times. It was found that break down area and lateral pressure as a function of hydrostatic pressure were nearly linearly related. In addition it was found that the three different values for break down area for each mixture were also linearly related. This resulted in a model that used the initial breakdown area, determined during the first 30 minutes after mixing, to predict lateral pressure as a function of hydrostatic pressure and time. A third model developed at the UIUC relates formwork pressure to the pressure decay recorded in a short test column (3 ft). The test column is rapidly filled, and then the formwork pressure is recorded while the SCC is at rest. The decay curve is fit to a mathematical expression, C(t). 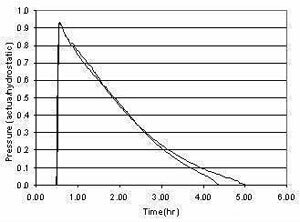 This pressure decay curve is used to extrapolate pressure drop for concrete pours at varying rates and varying heights of formwork. The model predicts pressure in a given element where concrete is to be poured based on element height and desired filling rate. Thus, the maximum pressure generated at a particular point in the wall element can be predicted for any arbitrary casting rate. An example is shown in Figure 7 that compares the formwork pressure for three different casting rates (4, 8, and 16 ft/hr). The slowest casting rate limits the pressure to under 5 psi while the rapid casting rate reaches 20 psi. Given that a typical industrial formwork is rated at 1000 pcf (~ 7 psi), construction at the slow rate would proceed with no problems, while construction at the 16 ft/hr could overload the formwork and lead to form failure. SCC exerts greater formwork pressure than normal concrete because it generally takes a greater period of time for its thixotropy to develop “self-supporting” structure in the fresh material. This self-support occurs much earlier than initial set, and is related to fresh concrete rheological behavior. Formwork pressure can be measured by using pressure sensors mounted in formwork. Laboratory studies using PVC test columns have proven to be convenient and reliable methods for characterizing SCC behavior. A better understanding of formwork pressure will lead to improved versions of formwork pressure models. Several formwork pressure models have been developed, and one common element is that all of the models require testing the candidate SCC and obtaining the value of a representative parameter to describe rheology, stiffening, or gelation. Such models represent great opportunity to improve prediction of formwork pressures in the field, allowing faster pour rates with greater confidence. These advances will make possible more economical construction with SCC. 1. Y. Vanhove, C. Djelal, “Formwork Pressures with Self-Compacting Concrete,” Concrete, June 2002, pp22-23. 2. F. Tejeda-Dominguez and D.A. Lange, “Formwork Pressure of SCC for Tall Wall Field Applications,” J.Trans. Res. Rec. (TRR 1914), 1-7, 2005. 3. J. Assaad, K. Khayat, H. Mesbah, “Variation of Formwork Pressure with Thixotropy of Self-Consolidating Concrete,” ACI Materials Journal, January/February 2003, pp 29-37. 4. R. Douglas, Raissa, “Summary of Current Work Conducting at ACBM -Northwestern University on SCC,” unpublished work, September 2005. 5. F. Tejeda-Dominguez and D.A. Lange, “Effect of Formwork Material on Laboratory Measurements of SCC Formwork Pressure, “Proceedings of SCC 2005, pp 525-531. 6. J. Assaad and K. Khayat, “Effect of Coarse Aggregate characteristics on Lateral Pressure Exerted by Self-Consolidating Concrete,” ACI Materials Journal, May/June 2005, pp 145-153. 7. 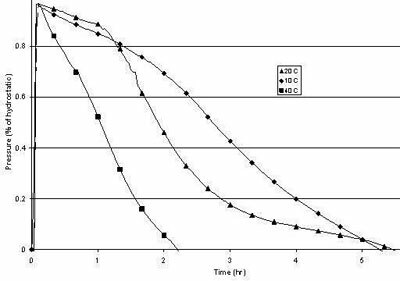 J. Assaad, K. Khayat, H. Mesbah, “Assessment of Thixotropy of Flowable Self-Consolidating Concrete,” ACI Materials Journal, March/April 2003, pp 99-107. 8. J.M. Barnes, D.W. Johnston, “Fresh Concrete Lateral Pressure on Formwork,” Construction Research Congress, Honolulu, Hawaii, 2003, pp 269-276. 9. C-A. Graubner, T. Proske, “Formwork Pressure: A New Concept for Calculation,” Proceedings of SCC 2005, pp 605-613. 10. K. Khayat, J. Assaad, “Use of Rheological Properties of SCC to predict Formwork Pressure,” Proceedings of SCC 2005, pp 671-677. 11. F. Tejeda, “Laboratory and Field Study of Self Consolidating Concrete Formwork Pressure,” MS thesis, University of Illinois at Urbana-Champaign, 2005. 12. B. Birch, “Formwork Pressure of Self Consolidating Concrete,” MS thesis, University of Illinois at Urbana-Champaign, 2007.